Deburring does not count as a core process in machining. On the contrary, it has up to now been considered a necessary evil. Again and again this has led to the machining processes being optimally coordinated, whilst the cost-effectiveness of the system as a whole suffered, owing to the fact that deburring was not taken into consideration as being part of the process chain right from the word go. Workpieces with complex geometries often contain machining sectors that are difficult to get at. Undercuts, pockets or internal, intersecting drill holes do not present that much of a challenge for mechanical machining processes. However, this changes drastically when it comes to the necessary deburring, as the burrs on sections that are difficult to reach must also be removed cleanly and without negative impact on the material. The methods used up to now - mechanical or thermal processes, or water jet technology - have not achieved the intended productivity levels, nor the desired reproducibility and cost-effectiveness. Medium size batch and mass production attach great importance to high quality, and internal burrs and ridges can adversely affect the functioning of a component. Another difficulty in practical applications is the so called ""secondary burr"", i.e. when during removal of the burr left by the original machining operation a secondary burr is created, leaving an undefined end machining status. It is fair to describe the precision deburring or burnishing of metal components using the electro-chemical machining (ECM) process as economically highly viable. As cycle times and output rates can be scaled using different degrees of parallelisation - i.e. 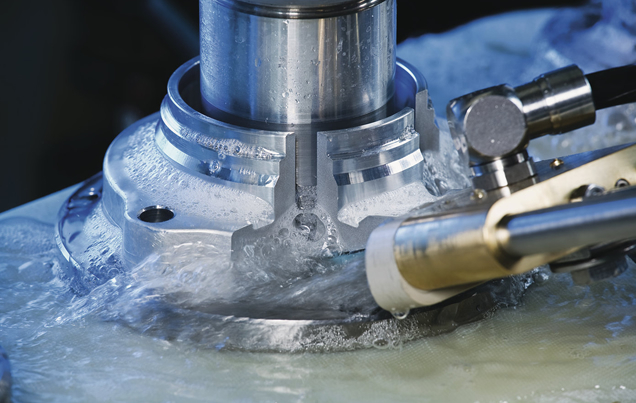 staggering the number of workpieces machined in one clamping fixture - cycle times can be reduced to under 10 seconds. Wear-resistant, precise, contactless and economical are all predicates that apply to the ECM deburring process. One example of a demanding deburring task is to be found in the manufacture of pump housings for common-rail systems. The mechanical machining and deburring of pump housings is currently considered state-of-the-art. However, a precondition is that the whole process is mastered. In the case of the EMAG Group, machining, automation and deburring are all covered by their firmly established technologies. With regard to the deburring process this is of great importance, as the relatively small problem of a burr can very quickly escalate to a crisis. To prevent this, it is important to define the machining direction right from the start, when choosing the operating process and the process sequence. Only then will it be possible to remove burrs economically and with precision. Using the electro-chemical deburring process instead of conventional deburring methods (mechanical or water jet deburring) has reduced costs quite significantly and made it possible to match the cycle time to the start-up and production phase by scaling the electro-chemical deburring process to suit the desired output rate.